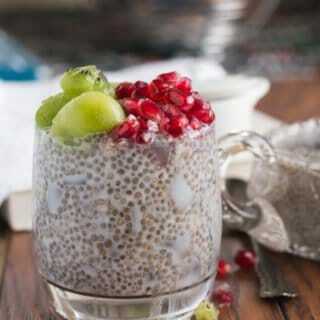 Coconut chia pudding recipe topped with coconut slices, kiwi, and pomegranate. The coconut slices add crunchy to the pudding. A Perfect healthy breakfast recipe. No cooking is necessary, just add the ingredients wait for half an hour or refrigerate overnight. No cooking is necessary, just add the ingredients wait for half an hour or refrigerate overnight. No mess and no fuss, very easy to make recipe. Chia seed pudding is not a great favorite dish to my son. He says it feels like gooey for him, so I added coconut slices while serving. The thinly sliced coconut pieces which add crunchiness to every bite. It’s no wonder, now this recipe becomes my one of my son’s favorite. You know, new recipes are born when attempting to respond to the complaints. You know, new recipes are born when attempting to respond to the complaints. I’m also happy that I can include chia seeds in his menu. If you are looking for other healthy, skinny breakfast recipes, then look into Yogurt Granola Parfait, Berry Smoothie Bowl, Yogurt Fruit Salad. I happen to see, tender coconut slices in nearby Costco stores, they work fine for this recipe. I love to add fresh coconut slices, and they are available in the frozen section in local Indian stores. They are awesome and they taste great and have a subtle nutty flavor. If you are not able to get any of the above ways, get a fresh coconut from your stores. Break open with a sharp-edged tool, use the knife to remove coconut pieces from the shell. Then slice them thinly. The leftover coconut can be frozen in a ziplock bag. It stays good for a couple of months in a freezer. A tip when you are planning to buy fresh coconut, choose white shelled coconut than the dark brown coconut shells. As white shelled coconuts are tender coconut and they are good for coconut water and for the flesh. Dark brown coconut shells are matured coconut and they have a strong nutty flavor. 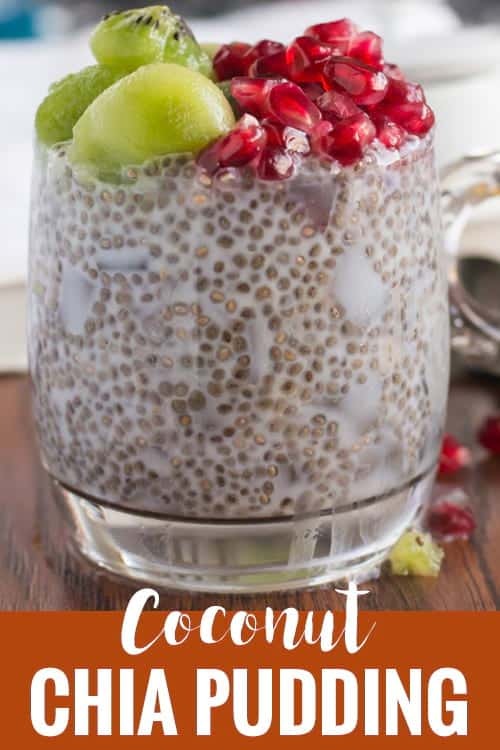 I have used agave nectar in this coconut chia pudding recipe, but you may use any other artificial or natural sugar or no sugar at all. All these versions taste great. If you do not wish to add coconut milk, you may also substitute with almond milk or soy milk. 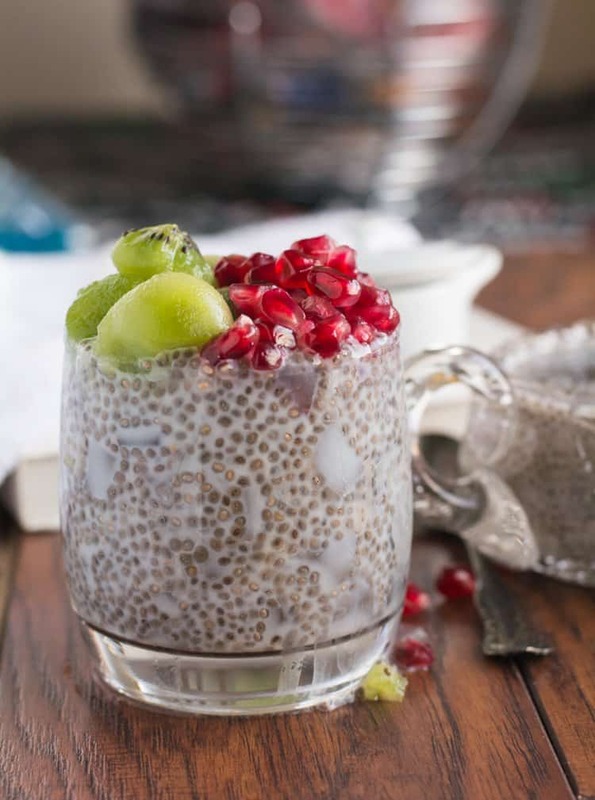 Coconut chia pudding recipe, a healthy, vegan breakfast. Made with coconut milk and fresh fruits like kiwi, and pomegranate. So, it is paleo and whole 30 diet. A best single serving make ahead, no cook dish. Tastes delicious even without sugar. Stir well and allow chia seeds to get soaked for the minimum of 30 minutes. Or refrigerate it overnight by keeping it covered possibly airtight. Serve with your choices of fruits. Not even gonna lie, dis thing was pretty mhmm good. i made these for my kids for an evening in summer and gotta say they asked for more and I didn’t have anything left! Thank you Fee, I’m very glad to hear this!